May 10, 1996, was the day eight climbers died on Mount Everest. Four climbers from Rob Hall’s Adventure Consultants Expedition, including Rob; Scott Fisher, leader of the Mountain Madness Expedition; and three climbers from an Indo-Tibetan Border Police Expedition that were scaling Everest from the opposite side died of falls or exposure. A member of the Taiwanese Expedition had died the day before from a fall. Against all odds and left to for dead, Beck Weathers stumbled into camp under his own steam. As Anatoli states, he is writing this book as a rebuttal to a perceived disparaging account of his actions in Jon Krakauer's book Into Thin Air. 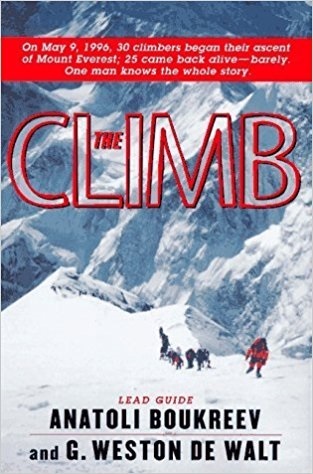 Anatoli explains his decision to climb without supplementary oxygen, the reasoning behind his decision to leave Yasuko Namba for dead and why since Beck did survive Anatoli had not brought him into camp. While some have hailed Anatoli as a near superhuman hero and others as a man devoted only to his own clients, I do not get that sort of feeling from his words. Anatoli felt that anyone would have done what he did if he or she were able. He mourned over Yasuko, gathered her personal item for her family, and even buried her where she fell. He has said he did not know where Beck was, as Beck had become separated from the others. His words have the ring of truth. Only those on the mountain that day could pass judgment on any decision made by anyone else who went through the same disastrous day. Each saw things from his or her perspective. Anatoli may not have thought himself a hero, but those that he aided can and have said differently!